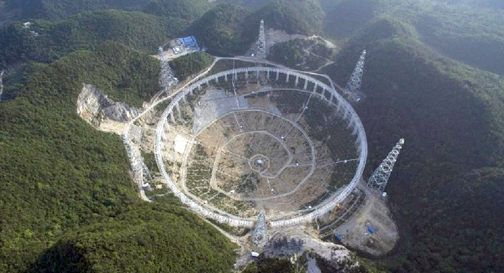 According to Xinhau, Southwest China's Guizhou Province has started to move 8,000 people from their homes to make way for the world's largest radio telescope, which will be completed in September, local authorities said Wednesday. The people being moved out are from eight villages in Pingtang County, of Qiannan Buyi and Miao autonomous prefecture. With a dish the size of 30 football grounds, FAST, the Five hundred meter, Aperture Spherical Telescope, is comprised of 4,450 panels. Scientists have depicted it as a super-sensitive "ear," capable of spotting very weak message—if there are any—from space. Upon completion in September, FAST will require radio silence within a 5 kilometer radius. A relocation budget is about 1.8 billion yuan (about 269 million U.S. dollars) and has come from the nation's poverty relief fund and bank loans. About a third of those being resettled are living under the poverty line and meet national requirements for resettlement, said Jiang Xiaoxiang, the deputy head of the Pingtang County. More than 600 apartments have been built in two new settlements, about 10 kilometers away from their original homes. The villagers will be compensated in cash or with new housing. Those who lost their lands will also be compensated, said Jiang. They will be offered jobs in tourism and support services for the FAST project. Construction of the FAST began in March 2011 at a cost of 1.2 billion yuan. Upon completion, the telescope will be the world's largest, overtaking Puerto Rico's 300-meter Arecibo Observatory.